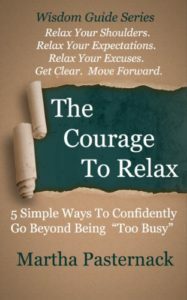 You can be skilled at each and every relaxation technique in the world but if you don’t find the courage to relax, chances are you won’t do it. Take a look at the chapters that follow and see for yourself that it is possible for you to put your knowledge and experience to work for you as you begin to trust your desire to feel better and to find your courage to relax. The Tao of Midlife is another way to say the Way of Midlife. It is also about middle age. It implies wisdom. It implies that there is indeed “a way” or “a strategy” to live successfully in midlife. Well, what I know for sure is that NOBOBY knows for sure about you…except you. This is the first of the Tao of Midlife books within the Wisdom Series. 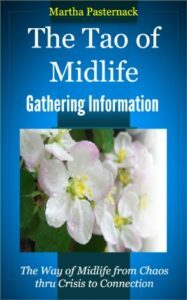 Here you will start to Gather Information and find connection to your wisdom as a person in midlife in ways you may never have thought of before. When you connect to your inner wisdom you are made stronger. You will get clear so you can move forward into a life self acceptance and joy.